You are here: Home » Join the PROMISE blogs and websites for up-to-date information. 55,000 hits & 2,300 comments strong on the DH! Join the PROMISE blogs and websites for up-to-date information. 55,000 hits & 2,300 comments strong on the DH! We have a number of online resources for students to receive information. 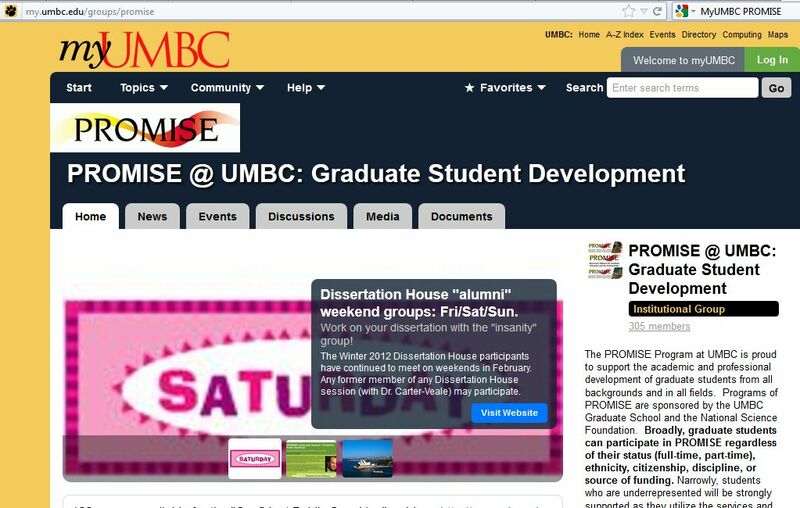 In addition to this main website for PROMISE which launched this past summer (5,000+ hits), we have an active Dissertation House website (18,000+ hits, 2300+ comments), an intranet site through MyUMBC (300+ members), a site that regularly lists all of the PROMISE Seminars & Workshops (32,000+ hits), PROMISE Facebook page, and a PROMISE Twitter site. Please subscribe or join these sites to get the latest updates via email. Don’t miss the webinars, dinner meetings, Dissertation House sessions, thesis completion workshops, academic achievement advice, professional development seminars, job announcements, and funding updates. While the MyUMBC site is limited to students on that campus, all of the other sites are open to anyone from any campus. Please join us! Stay informed. Participate, connect, and let us help you to meet your goals. Screenshot from the PROMISE page on the MyUMBC intranet. If you are a student at UMBC, please join the group. Preparing for academic success: things to do before class or early in the semester. ← Postdoc and Faculty Jobs “Down Under.” Consider Australia! good post. I like this sentence : Stay informed. Participate, connect, and let us help you to meet your goals.